^darwin award participants. didn't quite win. As we get further from the last avalanche cycle, signs of instability are becoming less frequent and sometimes less obvious. But they are there. On Sunday on the east end of the Stevens Pass zone, I poured over the snowpack identifying grains and performing many tests. 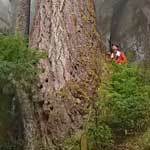 After emerging with contradictory test results, we experienced a large rumbling collapse 2000ft from the profile site. The collapse was all the information I needed to avoid avalanche terrain. The farther east one goes (obviously as long as there is snowpack) the more likely this kind of thing exists and can happen. In this case, all that was missing was a slope. The east slopes and valleys of the Cascades remain problematic. With very cold temperatures continuing and wind transporting snow and minimizing warm-up from early March sun this should remain a concern. Hard to know when this problem will become less significant. Watch the warm up this weekend as wet slides and slabs may be possible or likely. The freezing level spikes up quite a bit Friday PM and then rises further into Tuesday of next week. This is more problematic as the ridge of high pressure looks to be a dirty ridge with freezing levels to 7500' to maybe 10,000'. The dirty ridge will mean some cloud cover at least and minimal overnight freezes if it is cloudy. The greatest hazard will be further east where snowpacks are shallow and may be predominately depth hoar. Depth hoar has big grains and low bond density and high porosity so it doesn't take much warming to destroy those bonds. Full depth climax avalanches are possible in this scenario. Think Icicle Ridge or Snow Creek as examples, and definitely the Mission Ridge area. Follow the NWAC forecasts and look for the observations of recreationalists. Watch the warm up! While nearer the crest the avalanches should be mostly spring-like and something familiar to most - but perhaps worse because of a month's worth of low density cold snow - shallow snowpack areas East of the Crest could well be a different story. My experience of teaching avalanche courses over many years at Blewett Pass taught me that a shallow snowpack in the range of 37-43" could lose half of it's strength in one week through faceting - simply gaged by how hard it was to shovel. This was with cool to cold temperatures during a normal winter. Faceting is a process driven by the temperature difference from the snowpack base (near 0C) to the surface of the snowpack. When this difference is roughly greater than 1 degree C per 10cm (10 degrees C per meter or 40", bonds are destroyed and large grains created which are poorly bonded. The actual air temperature as a driver is not the whole story. In clear skies, cool to cold weather, the snow surface temperature was most often around 7 degrees Celsius colder than the air temperature and thus the gradient considerably larger than one would expect given average Cascade air temperatures, even east side. But this has been far from a normal winter period! So faceting should be much worse especially in these shallow snowpack areas. Of course, it takes a certain amount of snow depth to overcome surface roughness before slides are possible. But 30" or a bit less could easily be more than enough. Snowpacks are quite shallow nearer Leavenworth or Mission Ridge as examples. 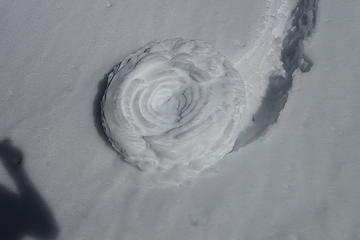 There are also likely to be layers of surface hoar. The recent Stacker Mountain avalanche reported to NWAC on March 7th in a 3-4' snowpack is a big warning sign as it was 3'deep and 75 yards wide, indicating a greatly weakened snowpack at depth. Avalanche danger will be elevated through the weekend and into next week as the first big warm-up takes hold. 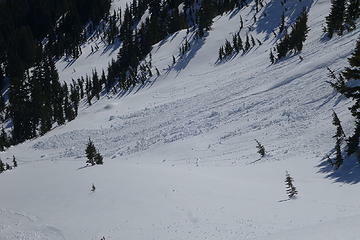 Natural avalanches are likely, particularly on southern aspects. Wet Slab avalanches: Slopes that face the sun will be the first slopes likely to produce slab avalanches. 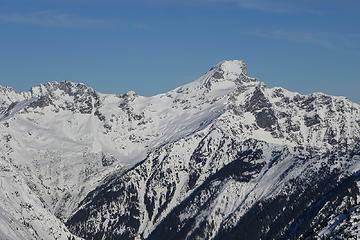 Initially avalanches will fail at the base of the recent storm snow, approximately 40 cm below the surface. If the warming trend continues as expected into next week, deeper avalanches are possible. Additionally, westerly, easterly and even northerly aspects may start to be impacted, resulting in some unusual (read scary) avalanche activity. As one gets to near treeline, wind effects during the winter become noticeable and weaker, shallow snowpacks are most often found in NW to SW facing terrain and near features that impact wind patterns on a small scale. How significant this problem becomes in this warm period is largely not predictable. Think of yourself as being transported to an entirely different climate and dealing with a Canadian Rocky or Colorado Rocky snowpack. No new avalanche activity has been reported recently. The heat wave has likely eliminated any trace of cold snow, but you may still find some on high elevation north features. Wind slabs are likely done at this point, zapped of their strength by time and warming. We're very concerned about the upper 20 to 30 cm of snow that sits on crust on steep south slopes and possibly weak surface hoar crystals on sheltered and shaded slopes. The even bigger questions are deeper in the snowpack. A layer of weak and sugary faceted grains sits on a melt-freeze crust about 50 to 120 cm deep. 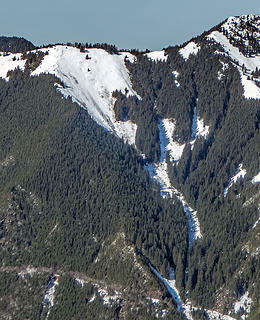 This layer is most prominent in the North Shore Mountains on north aspects. We're not expecting an overnight re-freeze for the foreseeable future. That's going to allow the snowpack to warm which starts freeing up a lot of water which lubricates the upper snowpack. It also allows the upper snowpack to start creeping downhill at an accelerated rate. How many hot days and warm nights will it take to wake up the more deeply buried weak layers? We're not sure, but now is probably a time to let the mountains do their thing from afar and check back in when the freezing level returns to seasonal norms which could happen by next weekend. Hot days & warm nights look to be with us through at least Thursday. Say goodbye to any kind of temperature driven overnight re-freeze for the next few days. This weather event is going to have a pretty significant impact on our snowpack. SUNDAY NIGHT: Light east/southeast wind, freezing level holding near 3000 m, no precipitation, no overnight re-freeze. MONDAY: Clear skies, light southeast wind, freezing level holding at 3000 m, no precipitation, no overnight re-freeze. TUESDAY: Clear skies, moderate southeast wind, freezing level holding around 3000 m, no precipitation, no overnight re-freeze. WEDNESDAY: Clear skies, light southeast wind, freezing level around 2500 m, no precipitation, no overnight re-freeze. It is worse in the Rockies and should go to the ground in many locations. There is no reason not to think we will not have similar conditions here on the East side, although cooler air could arrive sooner here. I just woke up thinking about your observation and that of catsp. That is an extremely pertinent observation. Your image clearly shows that it was a nearly full depth slide because the rockslide is visible in the track. When you think about it, that makes sense looking back to January. I recall in January I hiked both Si and Mailbox and they were essentially bare of snow. A friend skied to Lake Annette after February snows and it was bare with just the depth of new powder snow. In January Cascade snowpacks were very shallow below 3-4000' near the crest and about non-existent on South facing slopes to moderate elevations (maybe 5000'+). And the Olympics and far-Western Cascades, especially south facing also were all but bare. This was because of warmer than normal December/January weather with more than a normal number of relatively warm, sunny days. So, the entire snowpack is the low density powder snow from February/March and much of that should have faceted, especially through about March 10th. Hence, these conditions would be relevant for places like Sauk Mountain, perhaps Green Mountain, certainly Church Mountain, Morse Creek near Crystal, and perhaps above Highway 410, and throughout the Eastern and Northern Olympics and including The Brothers and Mt. Angeles south side. These areas are also the least likely to get overnight freezes. Hence, all of these locations are potentially super dangerous for the next several days and full depth avalanches are quite likely! Lots of wet slides yesterday. Large debris piles readily visible to the naked eye from several miles away. Continue to watch www.nwac.us avalanche forecasts if going out into this next weekend. Even more so, consider the feel of the snow. If it feels rotten and doesn't have a strong crust, slides are possible on any slope. How strong is a strong crust? Make a guess, win a prize. It is extremely complicated right now which reflects really strange weather in the past month and a half. Conditions should be highly variable, with the possibility of Canadian Rocky-like conditions in lower elevation or otherwise shallow snowpack areas east of the crest, and just very bad and odd spring-like conditions for mid-March in other locations. To complicate things further, it has been very windy from the east in many crest locations, especially south. Hence low humidity and cooler temps in some of those places and probably less damage from warming there. However, valley freezes may not extend very far above the valley - perhaps just a couple of hundred feet (like say Leavenworth, Mazama, or Ellensburg) and cooling wind effects and freezes may be very localized. Overnight lows ranged from near freezing to the upper 40's, depending on these factors. Stevens, for instance, is warmer at 5200' than at the highway. Mt. Baker was an astounding 64F yesterday afternoon, and very warm temperatures should be typical along the Nooksack, mid to lower Skagit, and Sauk, perhaps also the Stillaguamish?, and certainly in the Olympics. Washington Pass is also quite warm at 6600'. While the warmest air is just passing the Cascades today, it is still very warm and beginning Thursday clouds could inhibit a freeze. Yes, the warm sun will have less affect, but that could be balanced by lack of a freeze. It isn't until Saturday night that a good freeze may occur and then only to some elevation near 4500-6000'. If it clears late Saturday, the freeze would be more widespread. So, the best bet is to observe the snow and don't take risks until things quiet down.